I woke at 4am and decided not to return to sleep. I want to hang on to these last moments before big chemo starts again. Sadly, I know what this will be. I know how this will feel, how I will exit this morning’s injection. It’s my last morning to taste food properly. It’s my last morning to feel like I do right now. It’s my last morning to be out of the fog of the medicine that will get through the coming days. I will exit the fog, the haze, the yuck, but chemo leaves you forever changed. That’s its job. I will fight, fight, fight for the great days, for the good days, even the good moments. They will come. At the bottom, I know goodness will meet me. It always did, it always will. This morning Jason and I will together pack up the kids. I have this lovely African basket I use to carry coloring supplies to church. This morning I will empty its contents and place in it the things that help me get through chemo. I will fill the basket with the beautiful quilt a dear reader Amber made me; it will also include headphones, maybe a magazine, essential oils, mints for when the flush my port and make me vomit. It will hold a book, maybe a magazine by Sommerset because I can’t look at food. I need to find some tissue. I know I will be weeping as they poke my port to begin the slow injection. My love will be beside me, my friends close, and y’all carrying me in prayer. I know, I know, I know grace will be there to meet me in those future hard moments, but I’m struggling right now to see it. I’m crying because I know after today, raspberries won’t taste the same. Such a silly thing to cry over. Dear reader, I hope you never know what chemo is. For those of you that do know that bottom, I’m so sorry. The struggle I’m having this week is that I have no end to this new medicine. It’s not a hill to climb and finish. 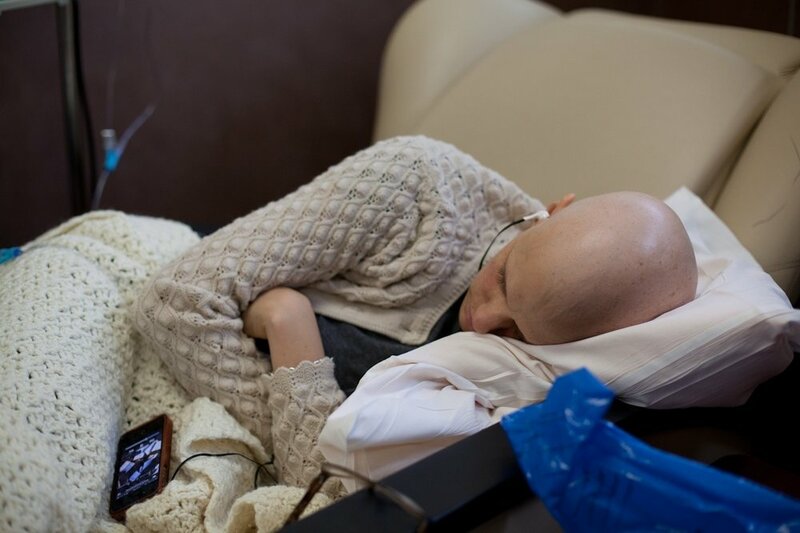 My last chemo lasted six agonizing treatments and then we were done. The hill conquered. I will be on this treatment until cancer finds its way around it, and then something stronger will come. Or we will simply know that our options have run out. Here are a few things I’m praying. Please join me. I’m praying that I will feel my footing quicker with this new chemo. I’m praying I would still have energy to read to the kids in my bed at night. I’m praying I would meet bald again and forever with joy. I’m praying I would not stop looking for grace. I’m praying I live well and with kindness when it’s painful. I’m praying I would press deeply into the love of Jesus to extend myself beyond the borders of my actually feelings. I’m praying for sweet moments with each of my people. I’m praying that I would know the deep love of God, and I would continue to live in the overflow of his overwhelming love towards those around me. I’m praying people would not see me as too delicate to be in honest community with me. I’m praying, simply praying I would learn to live well, even when I feel like dying. My port surgery went well. The button they placed on my chest that runs directly to my heart is placed. I’m sore, but the pain is manageable. One day of healing is all I have been afforded. When they called and told me they want the giant chemo the next day, I knew something wasn’t right. I thought to ask what my tumor markers were to the kind nurse. The news was discouraging. I then knew why my kind-faced oncologist wanted to make the change. I knew then why he called for my port to be immediately placed. My numbers were already in a bad place, but in 2 weeks they had jumped to a dramatically worse place. So we stomach the injections, take the pills, walk into the hard room of those in this battle. We do it, because what we see, feel, hear and touch is all we know, or maybe not all we know, but all we grasp in our finite minds. We know great, awesome goodness waits to meet us in heaven, in Christ. But I struggle, because I want to see, feel, hear, and touch my people longer. Even if the existence feels small, I cling to it. I know the moment will one day come when I look into the eyes of my dear husband and say, “I’ve given all I can to this fight, It’s time I fly away to endless days.” But today is not that day. So I will pack my basket, I will giggle with girlfriends and Jason. I will go out to breakfast and enjoy the tastes of food I love, even if I know that food may be coming back. I will relish the amazing taste of fruit one last morning. I will swallow a giant cup of strong coffee and enjoy its warmth and the love delivered to me by my guy. I will give giant smooches to my babies as they run off to adventure in their classrooms. They have little understanding of what’s happening. They know the big medicine has returned, and my hair will once again vanish. I will enjoy the kind nurses that gently tend me, and I will weep. Because today will be taking me one step closer to that moment. The last moment on this side of the veil. I have trips planned, running away with my loves, running away to tell my story. Running away to share about this Jesus, this Jesus that walks with me through hard moments. I will talk about how he holds my tears, gently guides my heart, teaches me kindness and love. The one that kindly points out my ugly and brings me to repentance. I get to tell that story a while longer. I will not be a vivacious as I had hoped, but I will be present. I am fighting to live well today from a place of brokenness, won’t you join me? Your broken looks a bit different than mine, but I know you feel those hard edges of today. Can we fight to live in love, in grace, moving towards those that are difficult in our lives? Can we live beyond how we feel, and press into a different living? A living that listens for the Holy Spirit, and waits upon Jesus for direction. Can we live large and joyful, not quiet and getting through? We go, we go, we go, but do we stop to enjoy all the going? This treatment will stop me for a time, but I will be face-down living waiting for the moment I can go again. So if you are able, move, move today in love. Kiss your guy or gal for more than a second. Kiss him or her in front of your kids so that they see your love. Embarrassing and large. Hug your kids until nearly crushing them, hold their hands, pack their lunches with love, and fold their clothes full of prayers for their future days. Sit and have coffee with a friend and ask them about their hearts. Love another today. It matters. It’s needed. You are not the only broken one today—that person next to you, they are too. I have one quiet request I have been tentative to ask.... Would you hear my quiet voice talking here? So many of you dear loves have come to me in love wishing, praying, asking that Jesus would give my cancer to you. In love, asking for my story to be different. I understand. I really do. But this is my struggle—if it were that simple, God would be a gambling God, a God that is changeable. But He is sovereign, He is knowable, as well as Lovingly leading us. He knows every cell in my body as He providentially appointed each cell in your body. I love your kindness and it comes from a place of deep love. But this is my story. We all pray mine is a story of miraculous healing—I believe he is able. But what He does not do is make trades for us. So love me, love me, love me with your prayers for healing. But our stories will not be switched. You have yours to walk in grace and I have mine. Let’s do it humbly, asking God to meet each of us. I woke this morning thinking of a song I loved in college. I played it when I first woke up and wept. I may belong among the wildflowers, but this morning I will be quietly sitting in a chair receiving the medicine that will extend my living. We pray. Older PostKara’s Collection: It’s Here! It’s Here!